Was There Corruption in the Court? Farkhunda’s death shocked not only Afghan people, but the entire world. Police couldn’t protect a young Afghan woman from a mob killing happening, not in a remote area, but right in the middle of the capital of Afghanistan. It was so scary. This was an awful and shameful act in which a poor woman lost her life next to a Kabul shrine. But I see the power of Afghan women to fight for justice over this issue and there are many people who pray and sympathize with her family. This gives me a louder, more powerful voice to scream for justice. I believe the court did not provide justice for Farkhunda. I am not happy with the decision of the judge and I agree with the many people who do not accept the sentences, including Farkhunda’s family. Afghan people wanted the court to punish all the people who committed this crime to set an example for those who would do this again. I had hoped the media and Farkhunda’s family would be permitted to attend the court on the day of sentencing, but the sentencing was closed. It is the right of the people to see that the court provides justice in public, but most of the media was not allowed to come to court. In Afghanistan we have district courts, appeals courts, and a Supreme Court, but we do not have a strong judicial system. The government created the courts. The government is responsible for these problems because it has not succeeded either in making a stable government or bringing peace and economic strength to Afghanistan. Corruption is the big problem in Afghan society and I cannot deny there was corruption in the court. The government has not dealt with the root problems of bribery in our government or courts. There is no overnight solution. But I am optimistic these things are getting better and that things can improve in the future because people are becoming more educated in many of these areas. Shokria, keep writing. Keep speaking out. Keep screaming for justice. 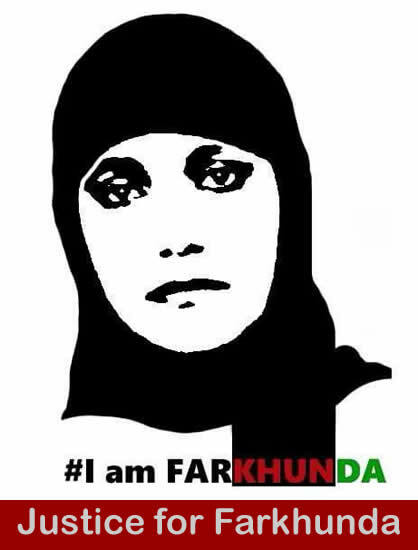 That is the only way Farkhunda will not be forgotten. Blessings to you. You are very brave for writing this.